Submitted by mahoney on Fri, 09/12/2008 - 12:33pm. Sunoco Gas Stations / Mini Markets USA...Sunoco is the only major gasoline retailer to sell four grades of gasoline in the U.S.: Regular (octane grade 87), Plus (89), Premium (91), and ULTRA 93. (Sunoco is currently in the process of removing 94 from stations and making it ULTRA 93 instead). Sunoco also once sold Economy unleaded, an 86 octane slightly cheaper than regular, in all of its markets until the mid-1990s when it was withdrawn from Pennsylvania and a handful of other states, and was phased out altogether in 2003. 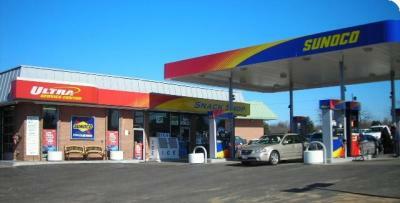 Sunoco is a major retailer and recognized brand in the sale of gasoline and convenience store items. Sunoco’s retail outlets are primarily located along the east coast of the United States, especially the I-95 corridor. This listing includes the Sunoco Convenience Stores, the Sunoco APlus Convience Stores and the Sunoco Ultra Service Centers. The Sunoco APlus stores carry national brand-named products, including: snacks, beverages, cigarettes, hot and cold lunches, and fresh-brewed Gulliver’s® coffee. Most of the stores are open 24 hours a day, seven days a week, 365 days of the year. The Sunoco Ultra Service Centers have automotive repair facilities. They have certified and highly-trained technicians use the latest on-line diagnostics to identify the problem and repair your car and offer a 12,000-mile/12-month warranty with services performed at any Ultra Service Center. All of the locations included in this file were obtained from the Sunoco official website listing.If locations in the original file were not shown on the website listing, they were deleted from the file. Gps visualizer was used to obtain the majority of the coordinates included in the file. If any locations were not included, please let me know. Updated NY. Net increase of 13 locations. Updated TX. Added 69 locations and deleted 89 locations. Updated OH. Added 42 and deleted 38 locations. Updated VA (added 9 and deleted 12) and VT (added 5 and deleted ). Updated WV. Decrease of 4 locations. Updated MI. Added 29 and deleted 23 locations. Updated ME. Added 3 and deleted 6 locations. Updated MD.Added 4 and deleted 9. Updated KY. Net increase of 11 locations. Updated GA. Added 19, deleted 16. Updated IN. Added 24, deleted 6. Updated DC,DE and FL. Net decrease of 22 locations. Updated CT. Added 12 locations and deleted 14 locations. Updated Alabama. Added 21 new locations and deleted 8 locations. Submitted corrected coord for the location at 5218 Milford Road, E Stroudsburg,PA 18301. Updated the file. Net increase of 337 locations. Updated the file. Net increase of 221 locations. Updated the file. Net increase of 97 locations. Updated the file. Net increase of 103 locations. Updated the file using the latest data from the website. Net increase of 23 locations. Updated to the latest website listing..Net increase of 15 locations. Corrected the coordinates for the locations for the Glacier Hills and Mahoning Valley SA on the Ohio tpk. Submitted a new location at 4998 Milford Rd, East Stroudsburg,PA 18302. Added a location in Joppa,AL and corrected the coordinates for the locations in Travelers Rest,SC. Corrected the coordinates for the location at 10010 US 1 South, St Augustine,FL 32086, (904) 794-1404. Updated the file. Net increase of 360 locations. Added 14 new locations in Alabama and removed 2 dupes. Added a location at 10010 US 1 South, St Augustine,FL 32086. Submitted corrected coordinates for the location in Scotrun,PA and also submitted some typing errors. Updated the file. Increase of 438 locations. Completed compiling the listing from the website locator. Added 3273 locations and deleted 328 locations.